Hey everyone! 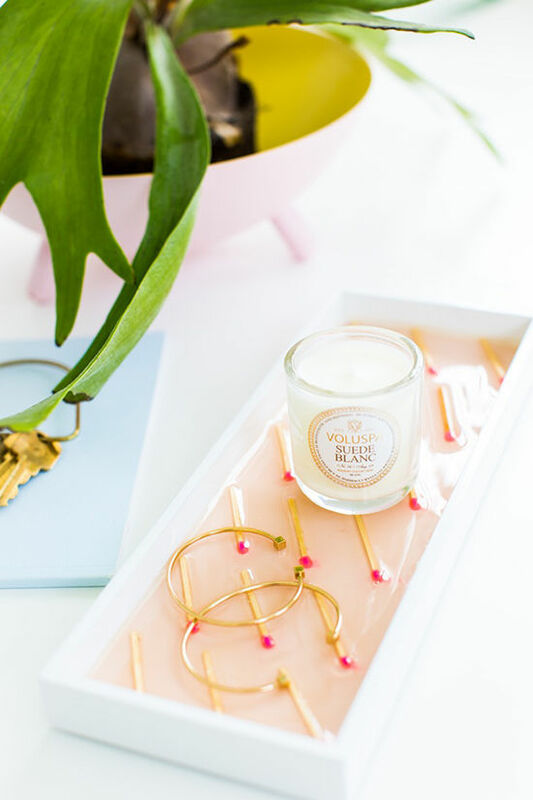 It’s Ashley from Sugar & Cloth here again with another simple home decor tutorial. 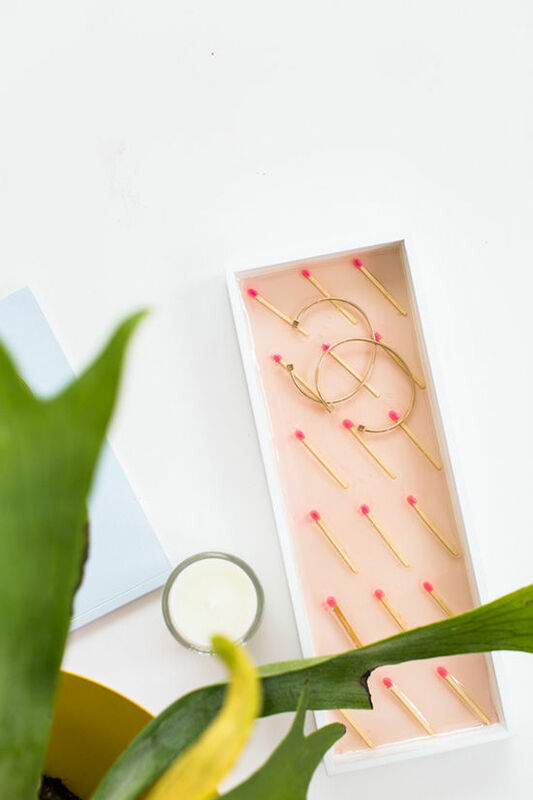 This time we’re putting those cute matches that you picked up solely for the cute packaging to good use. Let’s be honest, we’ve all done that! 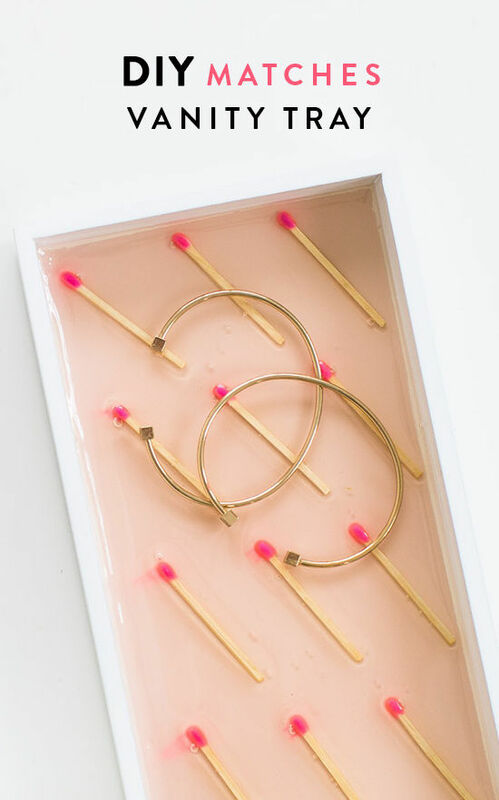 You can actually use whatever small objects or patterns you’d like, but this DIY matchstick patterned vanity tray definitely fits the bill for a statement piece for the bathroom, guest room, living room, or any other place you can squeeze in a little extra color. • If you want the bottom of your tray (or entire tray) to be a different color, you’ll obviously spray paint it first and let it dry. Once dry, lay out the pattern of your objects or matches to make sure you like it first. 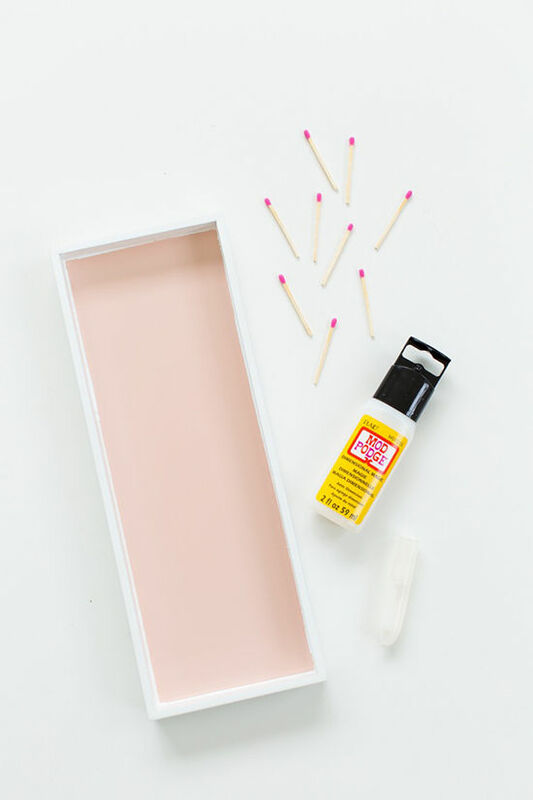 • Use a small amount of tacky glue one by one on the bottoms of each matchstick and place it back down firmly to make sure it stays in place. This will keep your design from moving once you have the top coat! • Squeeze on the 3 dimensional magic all over the bottom of your tray until there’s enough of it on the bottom that it completely covers all of your objects. 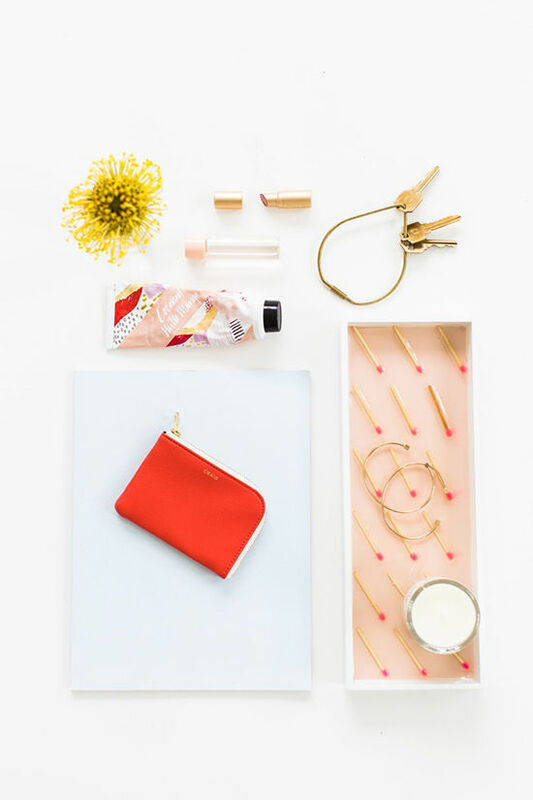 The idea is that it will harden and create an even surface for you to place things on, so be generous! Let it dry for about 12-24 hours depending on the temperature and humidity. • Once it’s dry you can style and place it however you’d like, and the clear coat will create a waterproof surface as well. In case you missed the last DIY home decor post, you can check out my DIY gold foil brushstroke pillow here! This is adorable. What an awesome idea! Now I’m thinking of all the other things I can drown in modge podge to make into a cool tray. 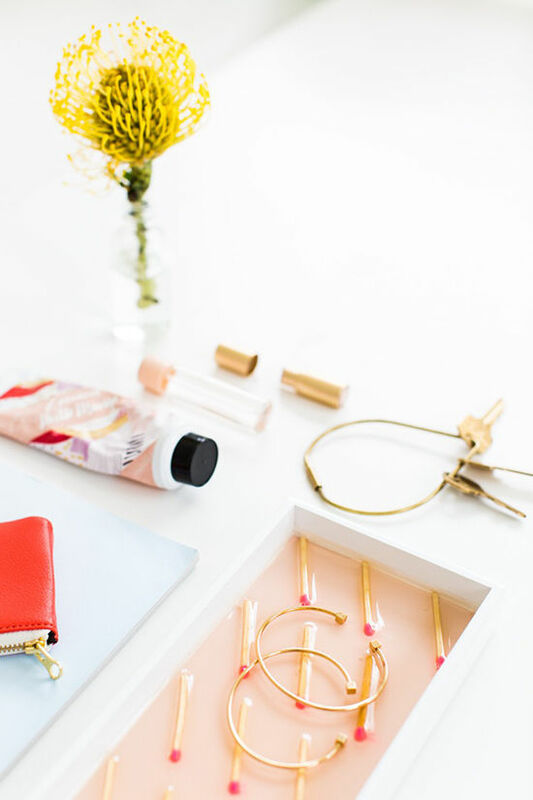 Those bracelets are adorable — where are they from? I have seen ones very similar to them at Forever 21 and H&M! Love this! So clever and unique! What an unexpected way of using matches! YOU are brilliant. Classic simplicity at its best! whan an unexpected way of wasting matches! This is beautiful! I didn’t understand what kind of “magic” to use? What is it? Could you send a link..? Hi! Love your tray!!! Works on ceramic tray? 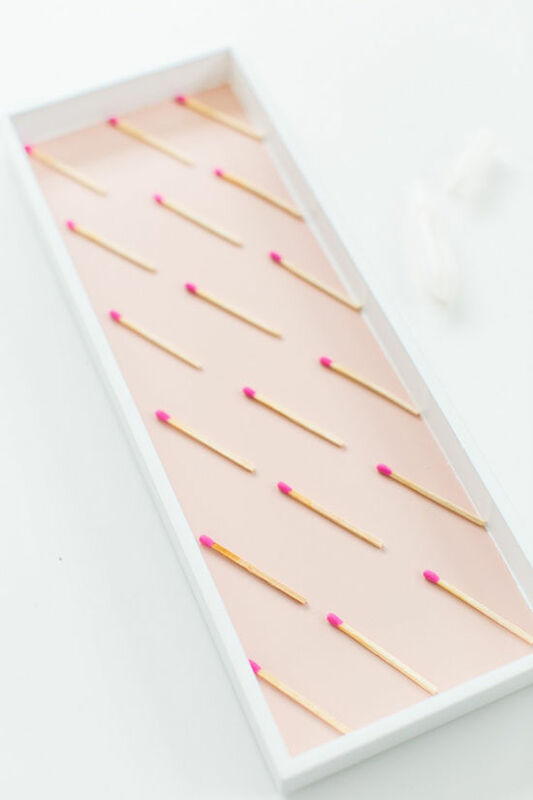 Where i can find pink matches? Brilliant idea 🙂 Thanks for sharing with us! made to be played on a wide range of hardware from personal computers in order to smartphones to name a few. I never would have thought of this idea, but you can base to many other things from this. I love it! I love it!! What color/brand spray paint did you use?